Cumbegue2 & 3 CD's released and now available for purchase and download worldwide! Click here for more Info! Multi-Award winning artist, Micky Cruz was born in Nicaragua, Central America, but his ancestry is Filipino and Mayan Indian. He was orphaned at the age of two when his family was killed in the Nicaraguan war in the late 1970s. He then raised himself on the streets of Central America and Mexico. Micky is a self-taught musician and composer who writes and produces all of his own music. His musical career began at the age of seven as a survival tactic due to the conditions of a third world country. He never thought that music would become a full-time career but people enjoyed his voice so much that it seemed to be the natural thing to do. Micky Cruz has performed extensively for many years in the USA as one of the premier acts taking the stage at the hottest clubs in the southwest , Casino nightclubs, and the big stages like Legends theatre and Las Vegas, Nevada. Micky Cruz is an award winning Latino musician having received the coveted Los 15 Grandes award several times in past years, including one in 2010! He has conducted many TV interviews, and well as several hits on Radio! 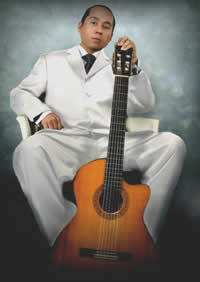 Micky's music is best described as Cumbia, Salsa, and Reggae with an interesting, refreshing twist where Micky has combined styles together and invented "Cumbegue" music. Totally unique, cumbegue music takes the best elements of cumbia-salsa-reggae and combines them into a very strong and danceable beat coupled with great melodic hooks and harmonies, then capped off with exciting soloing throughout the band. Micky Cruz "Cumbegue" music is now available as a digital download or CD! Join Micky Cruz On Facebook! Check out Micky Cruz Band videos here. Micky Cruz is available for parties, clubs, events, and shows! Contact Us Today! Copyright (c) 2017 - mickycruz.net. All rights reserved.